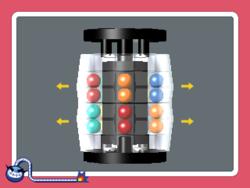 Info "Twist the barrels until the four balls in the middle are all the same color. Ten Billion Barrel is a barrel-shaped puzzle in which you match up colored balls. It was released in 1980." Ten Billion Barrel is one of 9-Volt's microgames in WarioWare Gold. It is based on the 1980 puzzle of the same name. The player must rotate the puzzle until the color of the balls match. 1st level difficulty: The player must make the match in one or four moves. 2nd level difficulty: The player must make the match in two or three moves. 3rd level difficulty: The player must match the two pairs of balls that are all one color. This page was last edited on March 10, 2019, at 13:08.